Enjoy craft beer and pub food in this cathedral-themed bar/restaurant along The Promenade in downtown Long Beach. 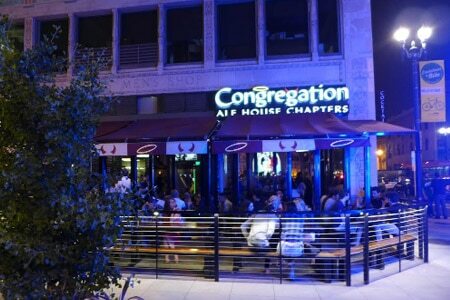 : Located along The Promenade in downtown Long Beach, Congregation Ale House features cathedral-themed décor and Monday Mass happy hour. There are 30-plus rotating beers on tap, including signature brews made at Congregation Ale House's Azusa brewpub. There's also a serviceable list of classic cocktails to enjoy, like a Negroni or a Planter's Punch. The restaurant serves up pub food like a rib-eye and white cheddar burger, and a pork and goat cheese sausage served with grilled onions, sweet peppers and beer mustard. You can also order a pizza with toppings ranging from traditional sausage and pepperoni to barbecue chicken or carnitas. Brunch is served on the weekends, and the football crowd can gather here on Sundays for discounted finger food.